Benaf's life partner reportedly owns a restaurant in Mumbai and despite their long relationship period, Benaf took care to keep her love life under wraps. 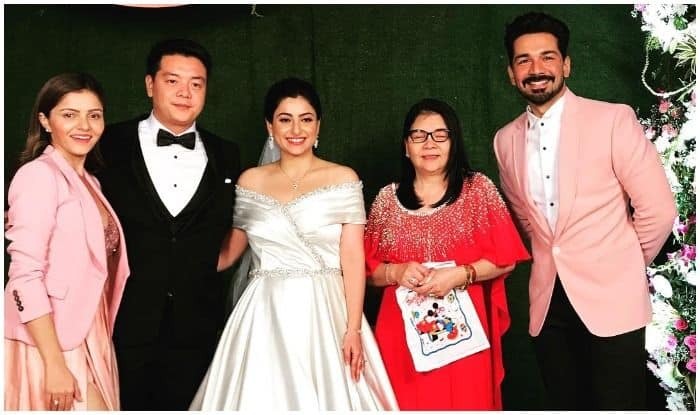 Reported to be dating her beau since 2019, television actress Benaf Dadachanji, who became a household name with Baa Bahoo Aur Baby, tied the knot recently with her longtime boyfriend in a hushed wedding ceremony. Later, a reception party was thrown by Benaf for her industry friends and family members. The lavish party was attended by celebrities like Ridhi Dogra, Raqesh Bapat, Sucheta Trivedi, Sharad, Keerti Kelkar, Rubina Dilaik and Srishty Rode. Rubina and Srishty took to their respective Instagram handles to wish the couple and gave us glimpses from the ceremony. Benaf donned a white off-shoulder gown at her wedding bash and a Swapnil Shinde’s design for her reception. Needless to say, she looked ravishing on both days. On the other hand, her husband donned a black suit on their wedding day and looked dapper. Benaf’s life partner reportedly owns a restaurant in Mumbai and despite their long relationship period, Benaf took care to keep her love life under wraps. On the professional front, Benaf has featured on the small screen in Jhansi Ki Rani, Choti Bahu 2, Byah Humari Bahu Ka and was also seen on the big screen in movies like China Gate and Bobby Jasoos.